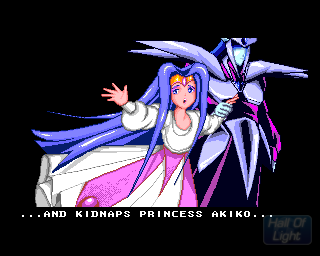 Gunbee F-99: The Kidnapping Of Lady Akiko is the full name although many might even remember it from its original name – Amibee. 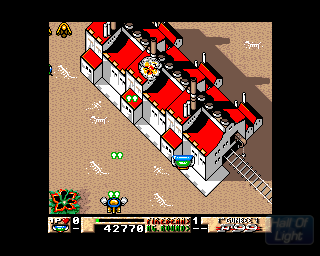 The name was changed to Gunbee when they moved the game from shareware to a commercial title, this might have been something their publisher APC-TCP requested for all I know and yes Gunbee certainly sounds a lot better than Amibee. 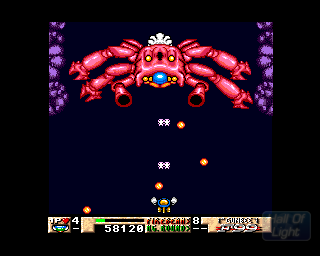 The transition from Amibee to Gunbee was quite big and the first thing you will notice is how much more of a full-blown game it is, proper intro, tweaked and adjusted everywhere and so on, oh and yes there are 5 levels in the full version. 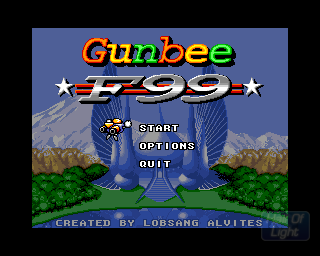 There are a few things about Gunbee F-99 that are a bit interesting, it requires 4MB ram (not entirely correct as it there are 2 versions and one require only 2MB ram) as well as the AGA chipset, a 68030 is also recommended and at first glance, it certainly doesn’t look like a typical medium to high-end Amiga game now does it? 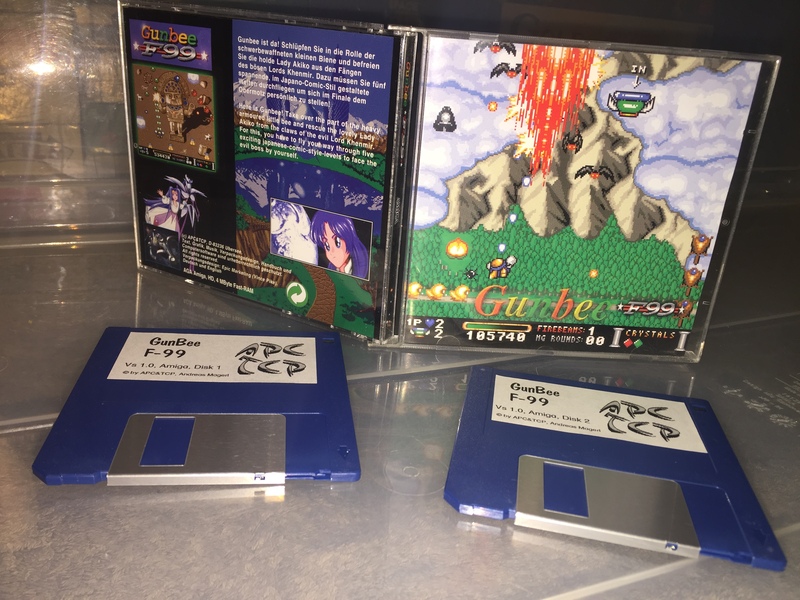 There were two releases of the game, One for Floppy and one CD release and both of them are identical to each other except for one thing and that is that the floppy version has to be installed on HDD (and therefore requiring 4MB ram(?)). 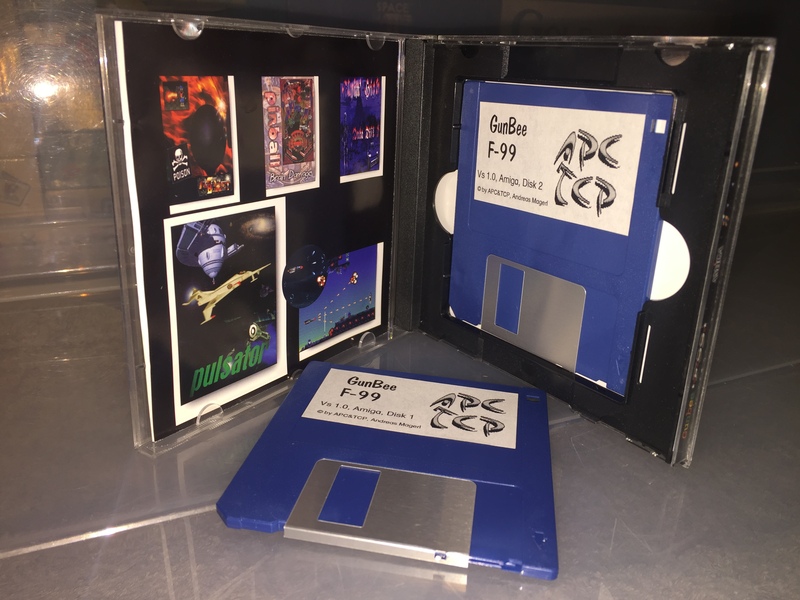 The version I got is the Floppy version (see box shots above) and as you can see it comes in a standard CD jewel case, there are a few other games on the Amiga that was released in the same way too (Tin Toy Adventures, Forrest Dump etc). Even more interesting is that this was the very first Commercial game produced in Peru, it was a one-man production at first but the author Lobsang Vogel Alvites Szaler (Mr.Byte/TEG) got help from various people (Team Eagles) to be able to get the game out. 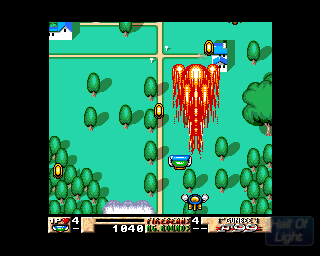 Oh and more thing, Gunbee is more or less a clone of the Konami hit game Detana!! 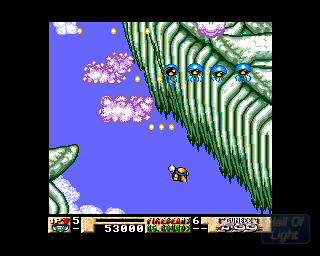 Twinbee which got a really strong following in Japan for the PC Engine among others, it is also known as Bells & Whistles outside of Japan. 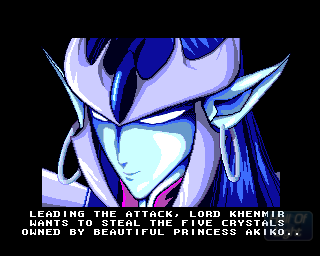 The intro kicks off with a rather nice Anime intro and while not true to the style it still is very good in terms of what they managed to chuck into an already crammed floppy disk set, lovely graphics and minimalistic animations bundled with a rather subtle yet upbeat soundtrack that bears a very traditional 80’s style. 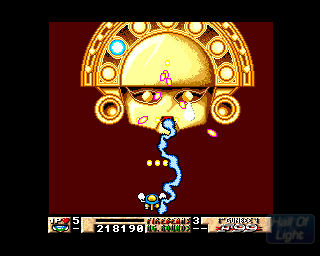 As for the game itself got 5 huge levels with boss fights and a lot of hard to kill enemies. 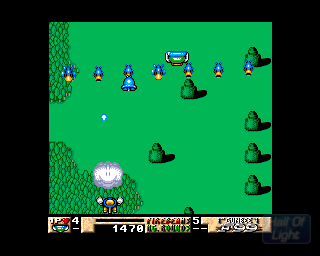 The game is basically a standard’ish Vertical shoot ’em up although there is a rather strange bell system where you pick up various coloured bells to upgrade/downgrade your arsenal. The main problem with the game for most is that you feel so god damned underpowered all the time and you will most likely never manage to upgrade your ship before you’re dead even, the reason for this is that the upgrade system requires you to shoot the bells way too much before you “might” get an upgrade and yes if you miss the upgrades then you won’t stand a chance for the rest of the game. 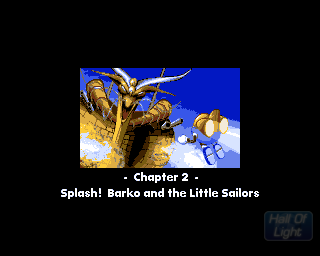 Once you master the game (if ever) then you will get to see all the wonderful levels and boss fights, the variety of everything is good and the style feels pure (if not very childish) throughout the game although I have no idea how on earth people can complete this game without a cheat. 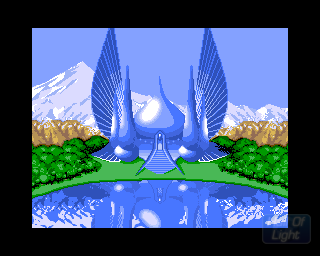 I had to resort to screenshots from Hall Of Light and a Longplay video to see it all as I simply can’t get past the Chapter 3 Boss. 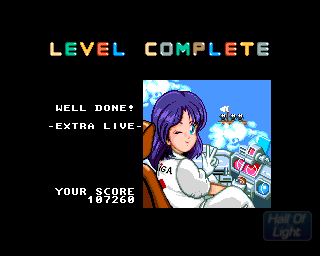 Technically the game works well although it doesn’t feel like an AGA game and the first reaction I had was that your “ship” moves way too slow and it is way too underpowered. After the negative feel sunk in then I went on to question the whole power-up system and if there was any logic to it at all, well, once you work out how to upgrade then it makes sense but it just feels so annoying and hard from the get-go, it’s almost like if the developer wants to punish the player and it simply doesn’t work, at least not for me. I have attached the Longplay video below, enjoy. I have tried to like this game a couple of times now, and I must agree much of the reason is the negative sides you mention here. Nonetheless, that anime style is gorgeous. Nice read!